DryMAX is a line of absorbent trays made of XPS, capable of meeting the most varied packaging demands of the Modern Retail and Fresh Food Industries. Thanks to their high absorbency DryMAX-drainage trays guarantee better product presentation and maintain products fresher for longer. 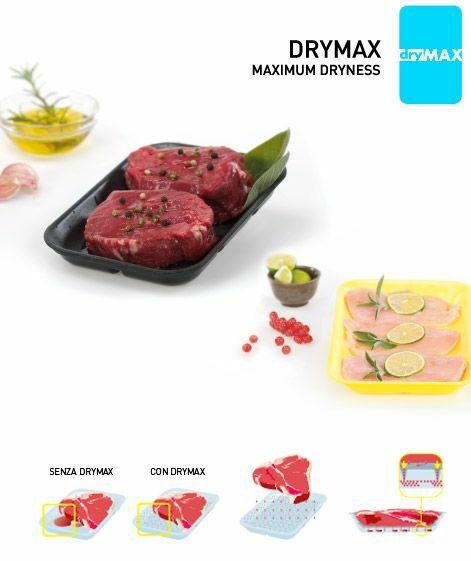 The special cellular structure and perforations distributed over the entire surface of DryMAX trays guarantee total liquid absorption even when displayed vertically, completely preserving intact the organoleptic specifications of the packaged product and improving appearance. DryMAX-trays limit the proliferation of bacterial flora guaranteeing the total hygiene of the packaged product. The central range of the DryMAX-line consists in four modular models, each developed over three depths. Thanks to DryMAX-trays it is possible to exploit display space in chiller counters to the utmost, providing a homogeneous aspect. DryMAX-trays are made of a mono-material (100% polystyrene) and are totally recyclable.